Today I found out the Australian Shepherd breed of dog was developed in the United States, not Australia. The Australian Shepherd is a popular breed throughout the United States, prized for its intelligence and good temperament. However, in spite of its name, the Australian Shepherd does not originate from Australia, but was developed on American soil. 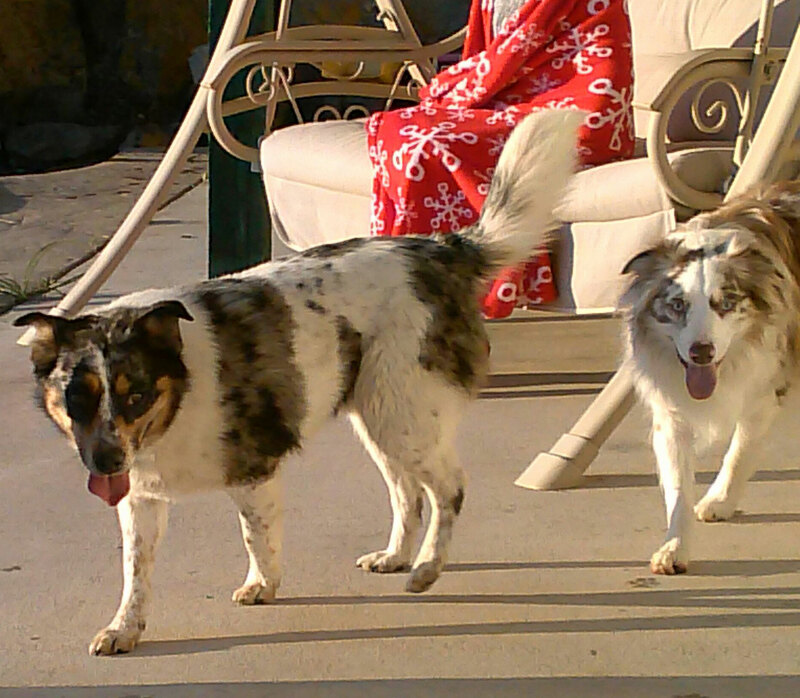 The breed was developed in the 19th century for herding purposes. Many immigrants brought sheep and other livestock with them, and to help manage the flocks, they also brought their favorite herding dogs. Although many dogs that arrived at this time were from Australia, it is believed that the primary ancestors of today’s Australian Shepherd were from Germany or Spain’s Basque region. There is also compelling genetic evidence indicating that the Australian Shepherd has ancestors that came over to the Americas on the Bering Land Bridge; so in some sense, at least part of the breed might be considered “native”. The breed particularly became well known and started to be sought after for their herding ability in the Colorado Rockies, as these dogs are able to maintain their high energy levels, even in extremely high altitudes and frigid weather. Somewhat more humorous than the “Australian” bit being incorrect is that once the breed finally became official, most “Australian Shepherds” were not used for herding anymore. They were not officially recognized until 1957, when the Australian Shepherd Club of America (ASCA) was first formed, and the current breed description was not formulated until 1977. It took another 16 years before the American Kennel Club (AKC) recognized the breed. However, long before they became “official”, the dog was bred and often used for herding. Despite its small size, it is extremely athletic, with strength and stamina to work all day without much decrease in its alertness, speed, or agility. It also is extremely protective of its flock- whether animals or, more typically today, humans- and has a natural tendency to want to herd, as you’ll quickly find out if you send a group of kids randomly running in every direction with one of these dogs around. This is also one dog that is not intimidated by the elements. Its thick coat has a water-resistant outer layer and an inner, finer coat for extra warmth. As to why the breed is called “Australian” despite being bred in America, with even its ancestors not coming from an actual Australian breed, the leading theory is that the dog perhaps used to commonly be used to herd imported Australian sheep. However, this is mostly speculation, and the dog was also used to herd many other things. A slightly more tenable speculative theory about why Australian Shepherds are called that is that they have a blue merle color pattern, similar to many dogs brought over from Australia to America; thus, because of the color pattern, they were simply called “Australian” as so many other dogs were that had the blue merle coloring at that time. Despite the breed not being officially established until relatively recently, the original name stuck when they finally got registered. Australian Shepherds are generally a healthy breed, though they may sometimes be prone to certain health conditions. Hip dysplasia is one such condition. This is a genetic disorder that causes a malformation of the hip socket. Though young dogs with hip dysplasia may appear quite healthy, as they grow older, because the thigh bone doesn’t fit the hip socket correctly, the bone will begin to wear. This will lead to arthritis. Hip dysplasia is usually treated will total hip replacement surgery. The condition is usually diagnosed by the age of two years. Aussies may also sometimes be affected by genetic eye conditions. One of the more prevalent ones is known as iris and ocular coloboma. This causes absence of part of the eye structure. Progressive retinal atrophy, cataracts and detached retinas can also be problems. Occasionally, epilepsy also occurs within the breed. There is no screening test available for such seizure disorders. If you like the Australian Shepherd but prefer a smaller dog, you’ll be interested to hear about Mini-Aussies. These delightful dogs share the same temperament and looks as their larger counterparts but are only 14 and 18 inches in height and weight between 17 and 30 pounds. The miniature version of this breed was first developed in 1968 by Californian horsewoman Doris Cordova. In the ASCA Herding Competitions, Australian Shepherds herd cattle, sheep and ducks. The “ghost-eye” dog is a nickname for the breed. They are also sometimes known as a “velcro dog” for their tendency to latch on to one particular individual extremely strongly, including sometimes only choosing to obey that individual. The Australian Shepherd’s extreme intelligence combined with a boatload of energy tends to mean if you leave them home alone with nothing to do, you can expect to come home to some shredded items or other destructive ways they’ve chosen to entertain themselves while you were gone. They also may get out their energy by jumping up and randomly running laps around in your house or the yard. If you have one of these dogs and they do this, you probably aren’t exercising them enough. Most Australian Shepherds are born with short or no tails. If their tail is longer than 4 inches, it is usually docked before 3 days of age, often without any anesthesia.